What with planning a 4 year old’s birthday party, work going crazy for the holiday season, trying to get all those recipes in and round ups done before its too late for people who come looking for Christmas recipes, the last couple of weeks have been crazy busy. With hardly enough time to cook decent meals for all of us, I barely get to cook anything out of the ordinary these days. 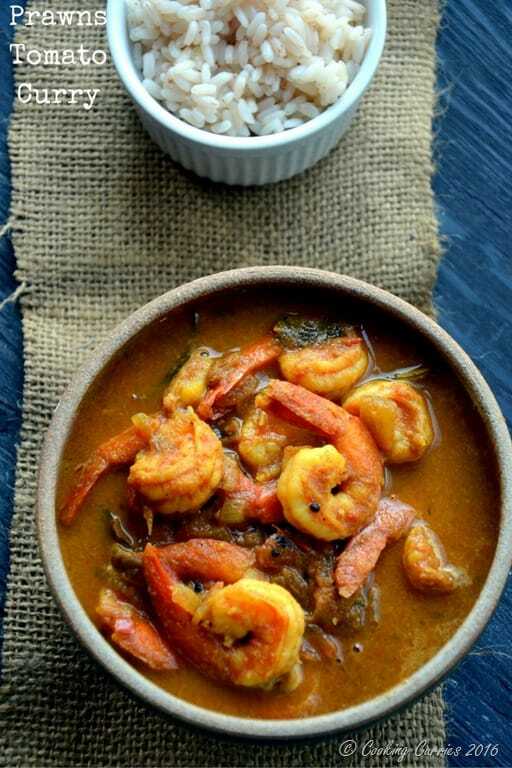 A Prawns Masala may not really be something out of the ordinary for most of you but with there being only one meataholic in the family, if I cook a meat or fish something, I have to cook something separate for myself. So, that’s practically like making two dinners. 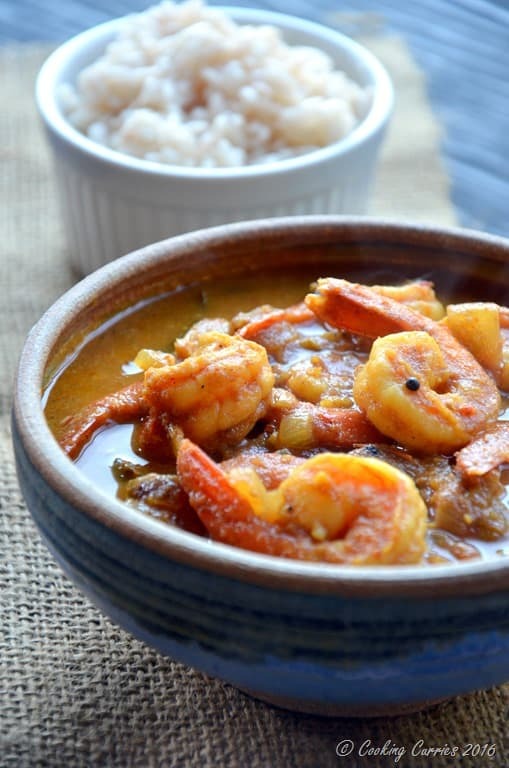 Here is a quick Shrimp Curry – Prawns Tomato Masala to make a real quick meal on such crazy days! Even though it looks like there is roasting and grinding to do – the actual cooking time is way less! Dry roast the ingredients to “roast and grind” over medium heat, till the coconut turns medium brown in color. Keep stirring so as to get all parts of all ingredients equally roasted. Transfer to a plate and let it cool. Grind to a fine paste, adding water as needed, in a mixer/blender/food processor. Heat the oil in a wide bottomed pan. Add the mustard seeds and let them splutter. Add the curry leaves. Pour the ground paste to it. Add the turmeric, cayenne,garam masala and salt and sauté well. Grind the tomatoes in a food processor until almost smooth and add to the pan. Let it cook for a while, till the tomato thickens and the sauce looks like its all mixed well together. Now add the shrimp and reduce heat to medium-low. Give it a good stir. Let it cook for just a couple of minutes till the shrimp is cooked. They will turn pink when cooked. You don’t want to overcook them. So, be watchful. Remove from heat and add the chopped cilantro as garnish. 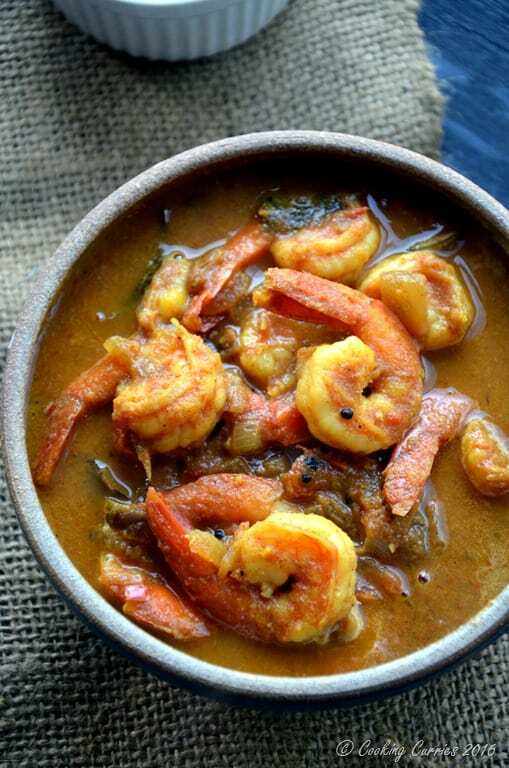 Enjoy with rice, rotis, bread or whatever you choose to enjoy it with. Dry roast the ingredients to "roast and grind" over medium heat, till the coconut turns medium brown in color. Keep stirring so as to get all parts of all ingredients equally roasted. Transfer to a plate and let it cool. Now add the shrimp and reduce heat to medium-low. Give it a good stir. 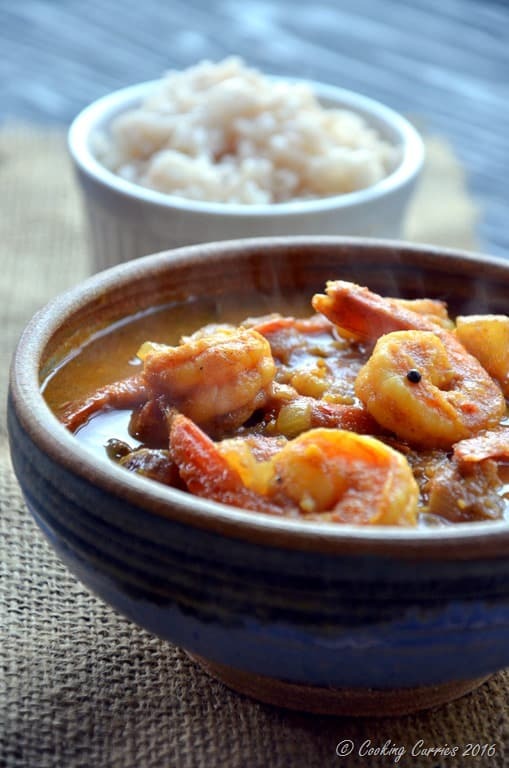 Let it cook for just a couple of minutes till the shrimp is cooked. They will turn pink when cooked. You don't want to overcook them. So, be watchful.